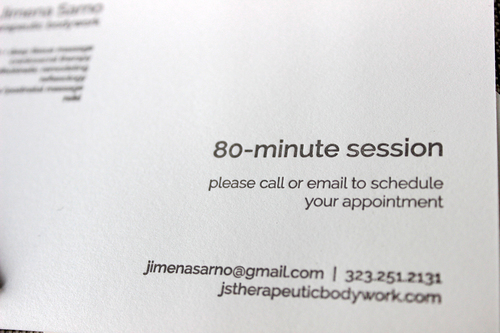 Excited to unveil these sweet little business cards, gift certificates, and thank you cards for JS Therapeutic Bodywork. Jimena is an amazingly gifted massage therapist—she has fixed my messed up back many times, and her craniosacral work is astounding. Design & image by Jimena. Business cards printed on extra-thick, 236# paper; gift certificates and thank you cards on 118# paper with matching envelopes, all in natural white with warm gray ink and blind deboss.